A nine-minute police dash cam video was the centerpiece for both prosecutors and the defense team in the high-profile manslaughter trial of Jeronimo Yanez in the death of Philando Castile, and on Tuesday that tape was released so members of the public can view it and make up their own minds, reports KSDK. Last Friday, a jury found Yanez not guilty of all charges -- both manslaughter in Castile's death and two counts of dangerous discharge of a firearm for bullets that were fired near Castile's girlfriend and her 4-year-old daughter in the back seat. The verdict set off a weekend full of protests from Castile supporters. 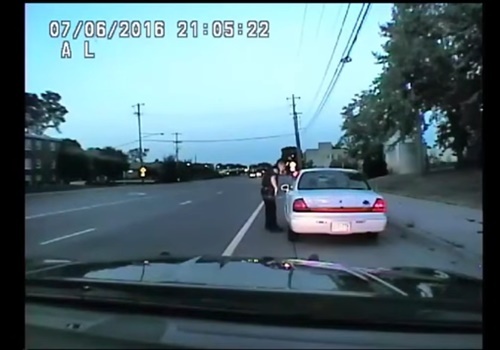 The video released Tuesday documents what unfolded that fateful night, from the moment Yanez (then a St. Anthony Police officer) begins following Philando Castile's car for a malfunctioning tail light, to the shooting and the lifesaving efforts that followed. Yanez was wearing a wireless microphone, and it captured the exchange between him and Castile that ends in seven gun shots in a matter of seconds. While the video shows the shooting of Castile, it does not show what happened in the car to reflect what Yanez actually saw before opening fire. The dash cam tape was just one piece of evidence released from the case files by the Minnesota Bureau of Criminal Apprehension (BCA). Also made available were the audiotape interview of Yanez by BCA investigators, the radio call by Yanez, full reports from the "use of force" experts used by both the prosecution and defense and photos of Philando Castile's gun, his wallet and permit to carry a weapon.